Mesh eyes have arrived! To my knowledge, these new Mayfly mesh eyes are the first that I’ve seen on the grid, and it is wearable with your regular avatar, just like texture or regular prim eyes. I tried on the mesh eyes, and used the built-in scripted menu to re-size the mesh prim to fit my avatar’s eye and also re-sized the iris smaller. I rezzed the mesh eye prim to show you what it looks like. As you can see, the mesh sculpt is shaped similar to your avatar’s eyeball, so the fit will be perfect (and not different from your regular texture eye). It’s really easy to wear, and does move naturally with your eye. These are some of my favorite colors from the Mayfly (Deep Sky Eyes) series. Grab a free wearable pair of demo eyes at the main store if you want to try these eyes! I noticed right away that the mesh eyes have more texture clarity than the regular texture eyes. Of course I still love some of my favorite texture eyes, but this is new and pretty cool! Also, you can wear two different eye colors, too. 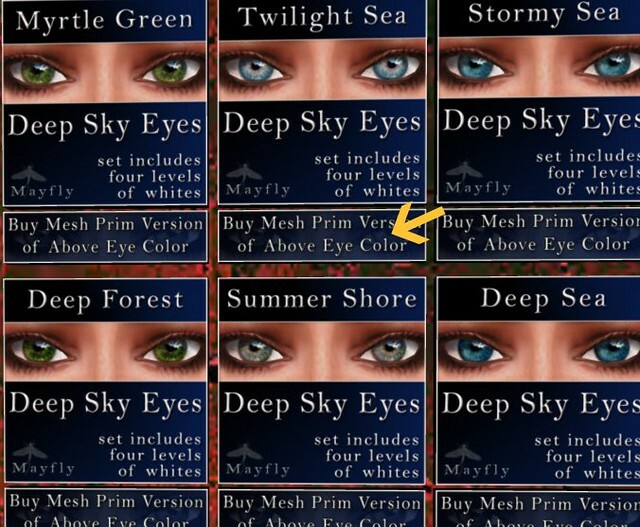 When you’re at the store, be sure to buy the smaller prim that’s labelled “Buy Mesh Prim Version of Above Eye Color” for the mesh version — the top one is just the regular texture eyes! I think they look better on you than on me… made me look scary… too big eyeballs but was worth the try. hi Alecks! 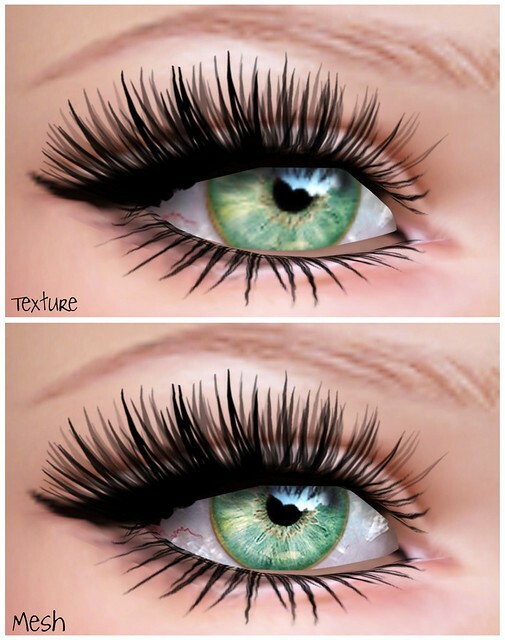 You can resize the eyeball via menu option B, I think I choose size 8! Hi Gogo. 🙂 Thanks so much for the wonderful post! You take beautifully clear pictures. Love ’em! Woo! What color are the 1st and the one before the free demo eyes ? Nevermind I think I got it. Green Tourmaline and Summer Shore ? Ah! Thanks! I didn’t even read the instructions as usual… -.- I’ll try it right away. Hi gogo!! 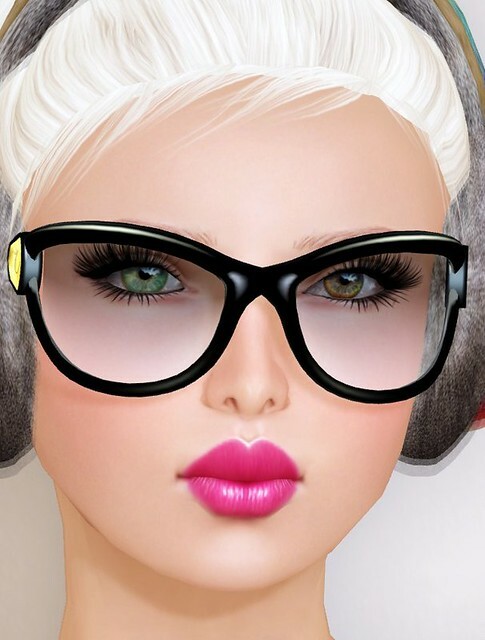 can you share where you get the ear muffs and those cutee geeky glasses! ty :)) hugs <3~~ oh yaa and possible the windlight settings 🙁 it doesntshow up as clear as yoursssss take care! They’re wonderfully detailed, but both those quasi-browns are far too multi-tonal and light for my av’s eyes. Shame, this. It seems superfluous to say, but you always do a lovely look Gogo, even when not focussing on other points in your outfit! Hii Gogo! wheres the hair from?! Its hot! those are beautiful, question, where did you get your eyelashes?